The Quest for Beauty | Who Are You Calling Crafty? A couple of days ago NPR had a report about lead in lipstick (yep LEAD) for me it was an eye opening article. Why lead and why the hell is it in my lipstick? Lead is a color enhancer for a brighter longer lasting color lead is used, the same for children’s toys. It isn’t that I doubt lead to be in my lipstick but I am kicking myself that I used it so blindly for so many years with out even thinking about it. My cousin recommended going to EWA Skip Deep Website and checking my makeup to see how hazardous it is. So I did and when I read my favorite foundation was rated 9 it scared the crap out of me. I put this on my face everyday for 8 years, I dealt with break out after break out, I change my cleanser so many times I lost count. The only thing I could do to hide the blemishes was to wear more makeup. It was a vicious cycle that I did for 8 years. I now rarely wear makeup and really haven’t for almost four years. My skin is almost blemish free, doesn’t itch like crazy, or is flakey in some areas and oily in others. The only skin cleanser I use now is an all natural soap and Peroxide on a cotton ball. The reason I mention this is because the last time I wore makeup was Date Night back in January. 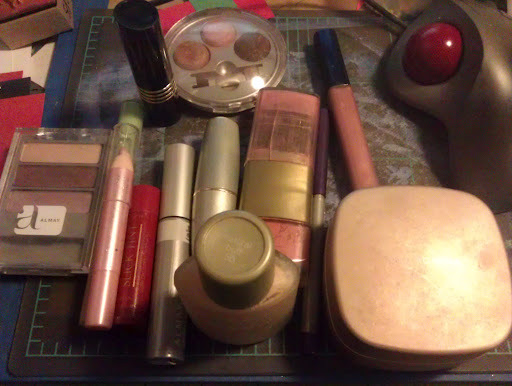 I did the whole thing: mascara, lip liner, eye shadow, foundation, powder, blush and of course lip stick. My face itched like crazy all night and I got home used my makeup remover and took it off. My face itched for days and I started breaking out (matter of fact I still have a slight breakout) but the lightbulb went off in my head, the makeup caused all those breakouts. I made the jump I threw all (well I kept my Burt’s Bees Lipstick and my favorite eyebrow pencil) in the trash can. My favorite eyeshadow, powder, concealer, mascara, blush, lipstick (Laurie Mercier), lip liner, eyeliner, and any other item I had dealing with makeup. Am I proud of what I did? Sort of because I felt like I was “sticking it to THE MAN (or woman)” and I of course thought what if I need makeup tomorrow what am I going to do? I mean to think for eight years (well more than eight years) I put that crap on my face, it was absorbed into my skin and my body is a little disheartening. Most men don’t have to worry about this unless of course they work in TV or the movies. So do the companies just play on the “Quest for Beauty?” I mean when I was in high school I rarely wore makeup because I wasn’t a girly, girl. I then got a job where I had to wear makeup, had to have the manicure and my hair had to be prefect everyday. I never questioned the stuff I was putting on my face was bad for me because I needed to look beautiful everyday. Why do we equate looking beautiful to wearing makeup? Why do we force woman to wear stuff that could be killing them slowly? I guess the lead in lipstick article led me to investigate the makeup I have been wearing for years. Now do I encourage everyone to take such drastic measures as I did? No, I do encourage all women (and men) to take a closer look at what you are using and know there are safer options out there. As for me I am mourning the tossing of my Laurie Mercier Lipstick and Almay Eyeshadow but I know this is the best course of action for me. Besides it gives me a chance to experiment with making my own all natural foundation, powder and blush before my brother’s wedding in August. A picture I took right before I threw everything in the trash can. Thank you for sharing this Amanda. Even if the hazards of a product are low or high people should be aware of what they are putting on or in their bodies and from that make a decision as to whether or not to use the product.As a scientist, I am appalled by many of the chemicals that go into processed foods, sprayed on produce, or injected into meat. But the products that you put on your skin can be just as bad if not worse. Many people do not realize that their skin is soaking up all that crap.So again thank you for sharing, the NPR article was very interesting. Congratulations! I wish more women would forgo makeup. It is such a silly thing, and such a bad advertisement for our young girls to think they have to wear a mask to be pretty. Clean skin, that is true beauty. Pingback: Testing Natural Make-up « Who Are You Calling Crafty?